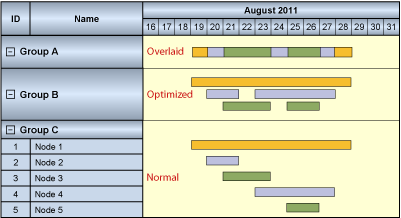 Many Gantt charts in enterprise-class applications consist of large amounts of data, and the challenge is avoiding the "I cannot the see the forest for the trees" effect. In other words: users demand to see the big picture and at the same time all details. One option to master this challenge is to summarize the data records into groups according to appropriate criteria, and then collapse these groups first. If necessary, you can then expand individual groups interactively in order to see further details. However, the disadvantage of this approach is that you only have the choice between viewing space-saving, collapsed groups on the one side and expanded groups on the other side, where each single data record fills a separate row. As often in life, users do not want an either/or-approach, they require a hybrid solution. With respect to this, NETRONIC offers a unique layout feature which is called optimized arrangement. With this layout, the data records inside a group are not placed into separate rows, but they are - as far as possible without overlapping - positioned side by side in one row. If bars would overlap, they are placed below the already positioned bars. Isn’t that a great feature? Please think about how to benefit from this feature in your own applications!